Brown with white lettering and white roof. 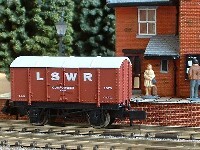 The LSWR, or London & South Western Railway to give this proud company its full and distinguished title, ran from the London terminus of Waterloo down through the Home Counties to the south coast and the West of England. 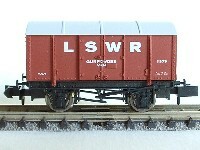 On its western boundaries it ran cheek-by-jowl with the GWR, so LSWR rolling stock would have been a familiar sight on GWR metals and vice-versa. In its Victorian and Edwardian heyday it carried commuters, holidaymakers, and of course lots of goods traffic of every description. These low-roofed steel vans, lined with sheets of copper alloy to stop hob-nailed boots from striking sparks, were used to carry hazardous loads such as mining or demolition explosives and military munitions. With LSWR lines serving the army garrison at Aldershot, the military range at Salisbury Plain and the Royal Navy dockyards of Portsmouth and Devonport, there were many such loads to be carried. 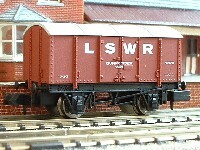 The LSWR played a vital role in transporting the British Expeditionary Force and all their equipment to the port of Southampton on their way to France to fight the Kaiser, and you can be sure there were plenty of gunpowder vans needed then. 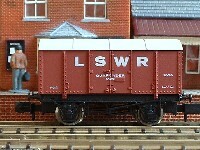 The post-war Grouping saw the LSWR absorbed into the newly-created Southern Railway, but much of their goods stock would still have carried the old livery for quite a few years to come, so one of these vans would look very much at home coupled up to your SR or GWR stock.